WASHINGTON — President Barack Obama is practically weepy at the thought of his daughter Malia going off to college, a milestone many months away that is already on his mind. Malia barely reached up to her father’s shoulders when they moved to the White House nearly six years ago with her mother, little sister and grandmother. At 16, she stands nearly as tall as her 6-foot-1 dad and is visiting college campuses in preparation for that bittersweet day in the fall of 2016 when she trades her White House bedroom for a dorm. She has been seen touring the University of California at Berkeley and the Palo Alto, Calif., campus of Stanford, where another president’s daughter, Chelsea Clinton, attended college. Obama said during a question-and-answer session with the chief executive of Tumblr, a social media site, that his daughter, like young people, in general, should shop around for a college. Malia goes into the 11th grade this fall at the private Sidwell Friends School in Washington. The Sidwell parent’s guide to college counseling suggests that juniors take the PSAT test in October, visit colleges as time allows, take the SAT exam in March and set up a family meeting with a college counselor in late spring, among other steps. Chelsea Clinton and her mother, Hillary Rodham Clinton, toured some colleges together, at times attracting a horde and at other times going unnoticed. Then President Bill Clinton never joined them, mainly because of the disruption that would have been caused by the large entourage that follows a president in public. The prevalence of social media and cellphone cameras practically guarantees that Malia’s college search will be even more documented than Chelsea Clinton’s 17 years ago. In September 1997, more than 200 journalists showed up to cover her first day at Stanford. Bill Clinton and his wife, who was Obama’s first secretary of state, were shocked when their only child chose to attend college some 3,000 miles away. Her parents were educated at East Coast universities — Georgetown for him and Wellesley for her — before they met at Yale Law School. And they thought Chelsea would follow their path. Malia’s journey into the next phase of her life will be a similarly emotional time for Obama, who grew up without his dad. 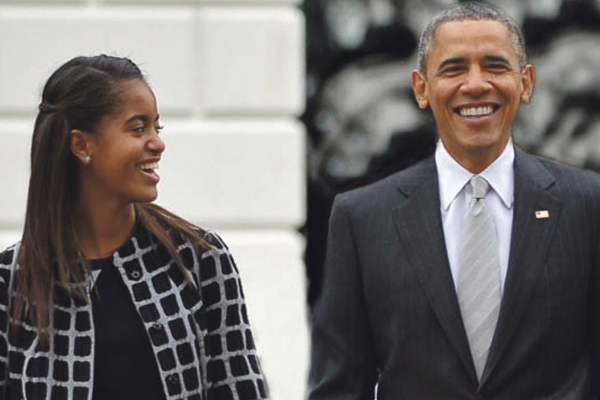 He talks about his desire to be a “present” father for Malia and Sasha, 13, and how living in the White House enabled the family to spend more time together than ever before. The Obamas lived in Chicago when the girls were born but he was often away in Springfield, Ill., when he was a state senator or in Washington representing Illinois as a U.S. senator. Already this summer, Malia has worked in Los Angeles as a production assistant on the set of Extant, a new CBS sci-fi thriller starring Halle Berry and produced by Democratic Party donor Steven Spielberg. She’s also learning how to drive.